Millions of Senior Americans suffer balance problems during their later years of life. Every year two million Americans fall and sustain serious injury, costing in excess of $3 billion dollars. Hidden costs include pain, disability, lawsuits, deterioration in general well-being, and the impact on other family members. 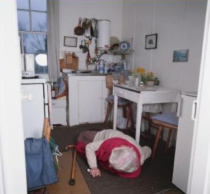 Falls and the resulting injuries have become one of the elderly's most serious health issues. As our senior population continues to grow, falls and their consequences will increase in the future. Hometown Home Health & Hospice has launched its Fall Prevention Program for our Seniors. The plan has been exclusively developed by its Physical Therapists and rehabilitation orientated Nurses. The program specially helps Seniors with Dementia or Alzheimer. The treatment with therapy involves stimulating the reflexes, to improve function. A reflex is something that you don't think about. Reflex is an automatic response to a stimuli. It is known that one can not "teach" any new information to a dementia or alzheimer individual, but the reflexes can be improved by specifically devised exercises. Another component of the program is the individual's routine and medication checks by Hometown's experienced Nurses. Certain medications given for behavior management can also cause falls. Our Nurses can identify those medications and coordinate with the individual's Physician to adjust or decrease the dosage. Let us help you prevent falls for you or your loved ones!